A few months ago, you may have seen on Instagram that Jacob was going to go in for an operation on his back leg as he was limping after walks. We took Jacob to a specialist in Alton and it was decided that Jacob would benefit more from having hydrotherapy, instead of surgery. Hydrotherapy was something we had only heard of once or twice, so didn’t really know what to expect. We wanted to share how Jacob got on with hydrotherapy, as we have seen a massive difference in Jacob! The specialist referred us to Greyfriars Rehabilitation and Hydrotherapy centre which is located on the Hogs Back between Guildford & Farnham. The centre actually does a lot more than just hydrotherapy. They also offer physiotherapy, inpatient care and pain management & acupuncture. When it came to the hydrotherapy, we have to say, we were all quite excited about exactly what a dog water treadmill looked like and how it worked. The first time we walked into the pool area, there were already a couple of dogs swimming, which of course, Jacob had to bark at a few times to let them know he had arrived! We walked round to the treadmill area and were met by a massive glass tank! Jacob looked tiny next to it. Before Jacob was allowed to go in, he needed to be fitted with a life jacket, which he looked adorable in! Two members of staff helped with the treadmill at all times to help support Jacob in the water. One would stay in the tank and help guide his back legs as he walked and the other supported his life jacket. We were told to bring with us something that would motivate Jacob to walk on the treadmill. Normally this would be a toy or food. Obviously, we chose to bring food. We stood at the front of the tank and held the treat in our hand just in front of him to make him walk. They started Jacob on 30 seconds at a time and did this 5 times. We were so proud of him as he took to it like a duck to water. The food certainly helped with that! Jacob had a block of 10 sessions, mostly having 2 sessions a week. As time went on, the duration also increased to 45 seconds and then a minute at a time. 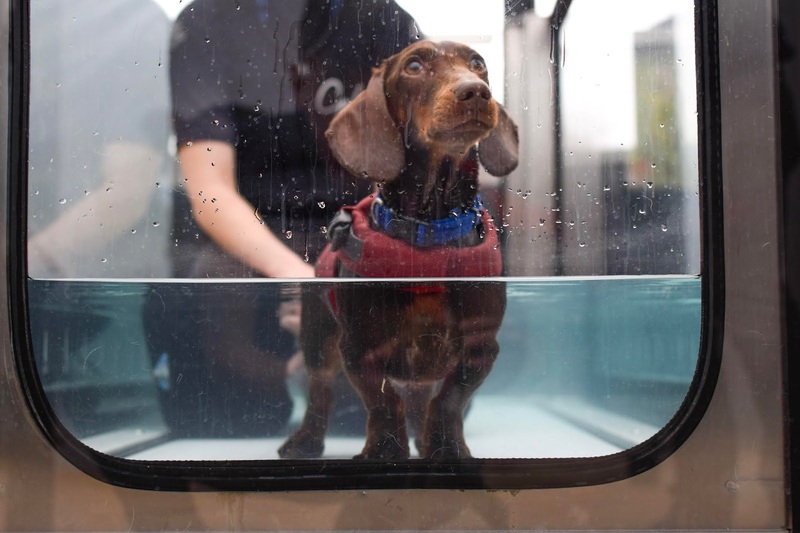 A lot of dachshund also have hydrotherapy who have IVDD or after surgery from the disease. At the time we were there, a little sausage dog called Django was an in-patient and having treatment. Thanks to the hard work of Greyfriars, he’s been making a steady recovery! All of the staff members who dealt with Jacob were super friendly and really made us feel at home. They all were very knowledgeable and we felt really confident in their ability to be able to help Jacob. We felt that they got to know us and also took a genuine interest in Jacob and each time we visited, they would be excited to see him. We are now a good few months on from when Jacob started his sessions and have now finished them. We have seen a real improvement in Jacob and his hind leg. He never limps on it now and also walks with a lot more strength and confidence, still wiggling his bum around! We would definitely say that the hydrotherapy was worth it and we couldn’t have been happier with the whole of the Greyfriars team. Thank you Kate, Kirsty, Alexa, Rebecca, Vanessa & Tanya. You can check out more about Greyfriars and the advantages of hydrotherapy here.